Any time you make digital copies of light or sound, you are already using compression. 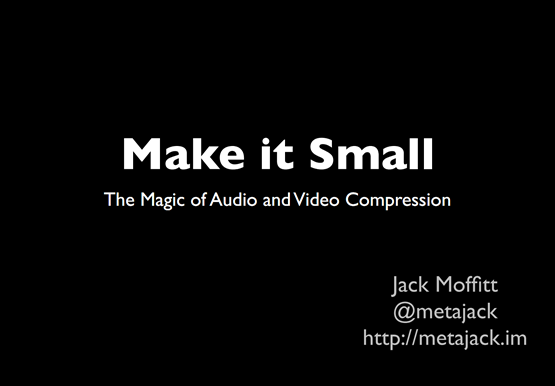 Compression is used to make everything (the Internet, your iPod, YouTube etc.) faster. Lossless compression means that none of the information is lost. Also, it is "reversable." Lossless compression isn't great for binary stuff (images, audio) but great for text data. Lossy compression is great for audio-visual media that humans consume. Codecs can remove the data that humans don't perceive, so that you get smaller files without a perceived loss in quality. Lossy compression relies on the brain's ability to insert info that isn't actually there. We don't notice what was removed. Audio demo of Led Zeppelin's "Stairway to Heaven" backwards. If you hear "satan" it's your brain just trying to make sense of the words in reverse. How to take advantage of these brain nuances when it comes to audio compression? Get rid of hi-frequency stuff; 20 MHz and higher, which can't be perceived by most humans. Can also use lossy compression for images/pictures. JPEG, for example, converts RGB to YCbCr. Some techniques for lossy video compression: motion estimation and prediction. Support royalty free and open standards! Check out Google's WebM Project for one.